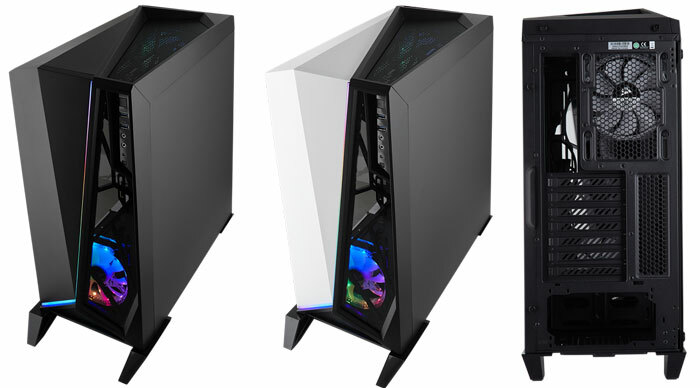 Only yesterday HEXUS reported upon the quiet launch of the Corsair Carbide SPEC-05 mid-tower value gaming chassis. 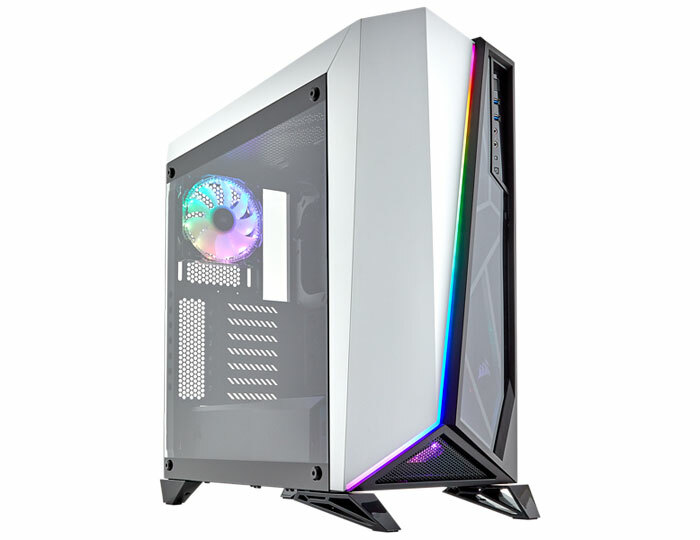 Today, in contrast, Corsair has been loud and proud in launching an enthusiast targeted chassis, the Carbide Series Spec-Omega RGB mid-tower gaming case. We have an official press release, photos and video of this striking RGB chassis to share with you. One headlining fact to whet your appetite before we go on is that this chassis features a Corsair lighting Node PRO digital RGB lighting controller and a total of 54 RGB LEDs pre-installed. The new Corsair Carbide Series Spec-Omega RGB PC case features a growingly familiar asymmetric design style with a similar design language to yesterday's value priced model. This time its more angular, and you can instantly see the more varied choice of premium construction materials and pumped up RGB LED options as soon as you see the Spec-Omega RGB. To the front there is a split between opaque matt steel, a tempered glass half section incorporating the front I/O, and a lower air intake vent area. Splitting the two main areas vertically is a strip of RGB lighting. To the left is a large but not full face tempered glass section. In all the user is presented with a bold, unique and modern look with plenty of RGB LED lighting options, says Corsair. Corsair includes its Lighting Node PRO digital RGB lighting controller with this chassis. It works with Corsair iCUE software for easy RGB lighting setups, effects, synchronisation, and more. As supplied, the Corsair Carbide Series Spec-Omega RGB is fitted with 54 RGB LEDs - 30 in the lighting strip to the chassis front, and 12 in each of the pre-fitted Corsair HD120 RGB chassis fans. This is a pretty full featured setup out of the box and more lighting strips and fans can be connected to the Node PRO controller. Onto more practical topics now, and this 232 x 495 x 516mm chassis can accommodate up to six 120mm fans, or up to a 360mm Hydro Series cooler in front, 240mm at top, and 120mm in the rear. Corsair name-checks the following AiO coolers as being compatible; H55, H60, H75, H80i, H90, H100i, H105, H110i, H115i, and H150i. The chassis design offers a 'Direct Airflow Path' with the minimum obstructions to get cool air in the front and warm air out the back and top. You can build your system around an ATX, MicroATX, or Mini ITX chassis and there are 7x back panel PCI slot cut-outs provided. Inside you can fit up to 2x 3.5-inch and 3x 2.5-inch storage devices. Maximum compatibility is as follows; Maximum GPU Length: 370mm, Maximum PSU Length: 180mm, Maximum CPU Cooler Height: 170mm. The Corsair Carbide Series Spec-Omega RGB is available in black or white finishes. Available immediately, depending where you live, the new chassis is priced at £139.99 here in the UK. The Lighting Node PRO is usually £49.99 on its own. Buyers get a two year warranty. What a truly horrible case. Its like they couldn't decide to use glass or steel so just went with both and a drunk designer! choose new lighting modes from a wide array of built-in RGB effects or create your own. The one and only decent feature of the case. Take that and put it into something with decent styling, then I might have been interested! Seemingly gone are the days that Corsair made stylish and understated cases. Yeah, it's like they swapped places with Thermaltake. Their cases are kinda classy now. Man, that is one fugly case, especially the silver one. What is going on at Corsair?!? !